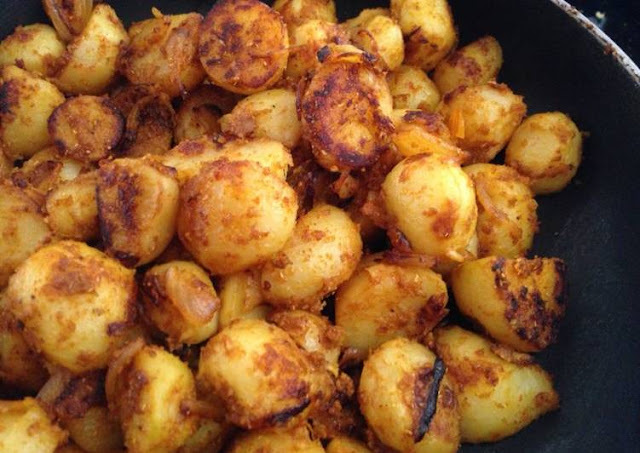 Spiced baby potatoes sauteed in Indian spices and herbs. They go well with any Indian meal as a side. Boil potatoes till al dente. Do overcook them since they turn mushy while roasting. Peel the skin if desired. Sprinkle rice flour and salt. keep aside till the onions are done. Heat a pan with oil/ butter. Add cumin and allow them to splutter. Add onions and fry till transparent. Add potatoes. Fry until golden. Serve hot or warm as a side to rice or any variety rice.